A woman has been left traumatised after cruel thieves poured the ashes of her precious pet across a bedroom during the robbery in Lurgan. 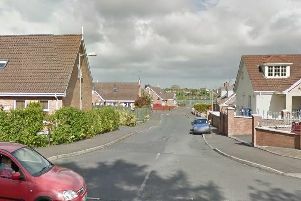 The robbers ransacked her Mourneview home and stole thousands of pounds worth of jewellery. Some of the jewellery included precious items including a necklace belonging to her late mother. They even tore open Christmas presents. However in an extremely cruel twist the burglars emptied an urn containing the ashes of the family’s dead dog. The woman, who lives in Margretta Park and didn’t want to be named, had been out with her husband, visiting her daughter in Banbridge. She had left at around 6pm and locked up, however she left the Christmas tree lights on and the lights on in the kitchen. When she came home at around 10pm, she discovered the back door open and the house ransacked. “Every room had been turned upside down. All my good jewellery was taken,” she told the Belfast Telegraph. Among the items stolen were the woman’s engagement and wedding rings, an eternity ring, a gold necklace bought as a gift for her by her husband, two gold necklaces that belonged to her late mother, two rings from her mother-in-law and a pair of gold diamond earrings that were valued at over £1,000. An emerald and diamond ring - given to her by her daughter as a birthday present that same evening - were also taken. Unfortunately, none of the were insured. “They even opened three or four Christmas presents, but because there was nothing valuable they just left them,” said the break-in victim, who did not wish to be named. The woman was shocked and even more distressed to discover that the thieves had also emptied an urn containing the ashes of the family’s dead pet. “My dog passed away in November, and I had his wee casket sitting at my bedside,” the homeowner said. Since the burglary, the woman has been unable to sleep or eat properly. While she was supposed to mark her 52nd birthday on Sunday, she did not have the heart to celebrate following the theft of her treasured possessions. The PSNI said it was investigating a number of burglaries in the Lurgan, Portadown and Craigavon areas that took place on 17 December. Detective Inspector Harvey is appealing for anyone with any information about the burglaries to contact detectives at Lurgan Police Station on 101. Information can also be given anonymously via the independent charity Crimestoppers on 0800 555 111. He said: “We would remind people to be vigilant and secure their properties, especially in the run up to Christmas. Take time to review your home security and take the appropriate steps to protect your home and belongings. If you need any crime prevention advice, please call your local Crime Prevention Officer on the 101 number. “It is imperative that people remember to close and lock windows and doors at night or when the house is unoccupied. If your doors aren’t secure, neither is your home - so do not make it an easy target for criminals - close it, lock it and check it.